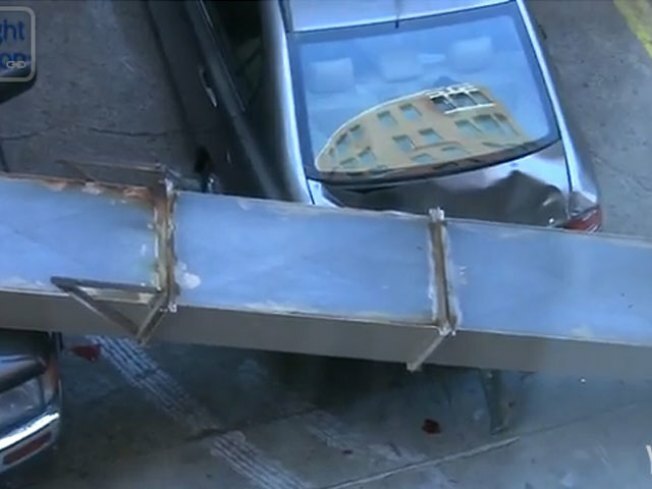 A ventilation shaft crashed down onto cars parked below in an alley in northwest D.C., and some quick-thinking Sunlight Foundation employees videotaped the whole thing. Sunlight employees working in a building across the alley from 1818 N Street NW said they noticed the shaft swaying at about 11 a.m. They said they warned the 1800 Cafe and the building's manager, but the warning was too late. The swaying shaft gave way, crashing down onto several parked cars below. "We were serving customers and I heard this steel-like noise," said 1800 Cafe owner Mike Choi. Choi also owns the cars crused by the shaft. A worker in a Dupont Circle office building shoots video of a large ventilation shaft tumbling to the ground. "That noise got bigger and we had no idea what was coming, what was going to happen within five minutes," he said. "And I heard the earthquake sound -- Bang!" "While the warning was delivered our Multimedia Content Producer, Noah Kunin, taped the event. Here's the video showing the unfortunate aftermath and our delirious reaction. 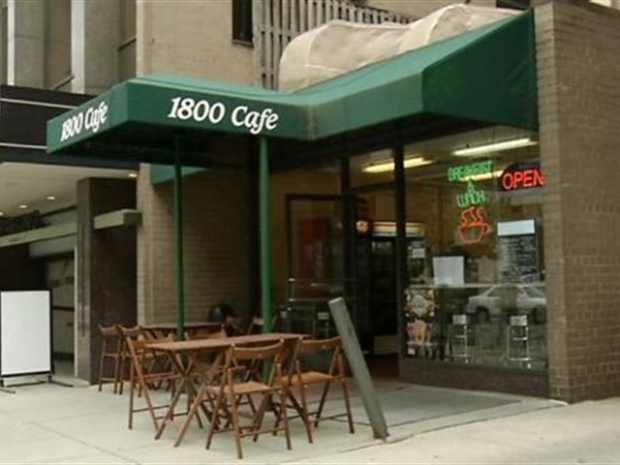 We hope the cars it crushed are insured and that the 1800 Cafe is back in business soon." "My window, actually, is directly across from where the ventilation shaft was, so as I'm looking out past my computer screen, I look at it everyday, and I suddenly realized it was falling toward me and was seeing all the bolts pop off from it," Kunin told News4's Elaine Reyes. He had just enough time to grab a camera. No injuries were reported. It is not yet clear why the shaft fell. Stay with NBCWashington.com and NBC4 for more information.